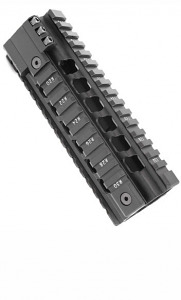 The Ergo Z-FLOAT free floating quad rail is made from machined and anodized aluminum. The four - rail system provides for an array of opportunities for mounting accessories such as lights, lasers, foregrips, and flip-up sights. Includes handguard cap. Compatable with Adams Arms Piston System. Requires removal of delta ring.